Debbie Thomas and Deb Zynomirski represented DHS at the Annual District 9 Presidents’ Meeting Sat. Oct. 29th 10am -2pm, at Rittenhouse Hall, St. Catharines. Thanks for representing our Society, ladies! We look forward to fresh ideas you bring back to DHS. Oct. 26: A BIG THANK YOU TO Gloria Hunter, Deb Zynomirski, Steve Elgersma and Debbie Thomas….for planting 250 special and 150 regular bulbs in the 2 bridge beds as well as 56 ornamental cabbage. A BIG THANK YOU TO EVERYONE who came out to help…..many hands make quick work! 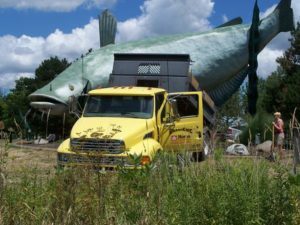 We had 27 hardy (young and older) volunteers in all ….pulling, weeding, loading, carting…..along with Mike Lessard and his son, Caleb Lessard, from Jeff’s Lawncare, providing a large truck and trailer. Everything was loaded and Mike took care of carting away the plant material and disposal. It saved so much time. Thank you, Mike and Caleb. 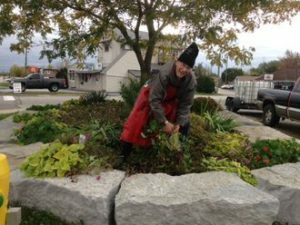 Hardy Dunnville Horticultural Society (DHS) volunteers have been busy spreading mulch, and on some of the hottest, most humid days this past summer and fall. We spread just shy of 50 yds of mulch about 5″ thick on the town flowerbeds. Mulch is applied for many reasons including cosmetic, water retention, weed suppression and, as it breaks down, soil enhancement. Thank you to “Grand Garden Gallery” for donating the black decorative mulch for under “Muddy” and “McKays Stump and Tree Removal” for their donation of natural mulch for the “East and West Welcome Signs“ and the ”Christmas Tree garden bed” in town. Mulch was also acquired through Haldimand County from the tree removals in Lions Park. DHS, for the very first time, participated in “Haldimand Motors Great Tricycle” event, entering both a float and the race, proudly taking home over $3350. in prize money. The proceeds have been earmarked for a few projects including the restoration of the 1967 Centennial Fountain located in Dunnville’s Centennial Park (to be completed during 2017), Canada’s 150th birthday and Centennial Fountain’s 50th birthday. DHS officially launched a new website! 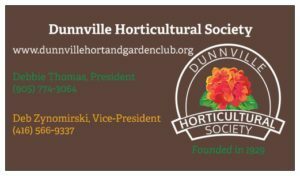 Please visit us www.dunnvillehortandgardenclub.org and let us know what you think. You will also find details about our upcoming Oct. 22 Program, featuring Jeff Bokma “Houseplants 101” from Vermeer’s Garden Centre, as well as our Annual Flower/Vegetable Show and Seed Exchange. Program begins at 7pm and doors open at 6:30pm. As always, everyone is welcome and there is no cost. Mark your calendars for Sat. Oct. 22. We’ll meet at 9am at the Bridge to clean up the town flowerbeds. Volunteers are appreciated. Any questions or comments, please contact Debbie Thomas President DHS 905 774 3064. Autumn is a season of beauty and reflection for gardeners. There are a few gardening tasks to prepare for winter and plan ahead for the next gardening season. Fall is a good time to “dig and divide.” It is not too late to dig up mature perennials and divide them into smaller portions to replant around your garden or share with friends. The trunks of fruit trees may be wrapped with a plastic spiral guard to prevent rodent damage in winter. Mice and rabbits can wreak havoc on young, tender bark. Wrap evergreens with two layers of burlap: one layer to protect against the burning sun as it reflects off snow and another to protect evergreens from wind. This is especially true for cedars, junipers and like, that are on the east side of a road, where they catch the prevailing west wind with salt spray. Fall fertilizer may be applied late in this month or early November. Fall lawn fertilizer builds strong lawns in numerous ways, but mostly at the root zone where they need it most this time of year. Fall is the time to plant garlic cloves. Plant cloves about 4 cm deep and 10 cm apart. Use loose, open, sandy soil as they like water to drain away from them. Your garlic crop will be ready to harvest next August. After the first serious frost, dig up your dahlias and lay the ‘bulbs’ (tubers) in the sun to dry for a day or two. Store in a large, craft paper leaf bag with dry peat moss or shredded newspaper in a cool but dry place. Plan to plant them up in March for a repeat performance next season. Do not cut back fall flowering ornamental grasses, coneflower, rudebeckia and all of the autumn flowering plants that produce a seed head. The birds will forage the seeds well past the first snow fall. For more excellent gardening tips and inspiration, visit www.dunnvillehortandgardenclub.org. 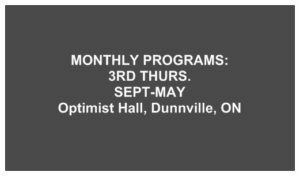 Better yet, join us Oct. 20, 7-9pm for our Dunnville Horticultural Society Monthly Program Night. Jeff Bokma from Vermeers Garden Centre, Welland will be speaking on “Houseplants 101.” We meet at the Optimist Hall. Refreshments are served and the evening is free to members and non-members alike. Contact Debbie Thomas, President at (905) 774-3064 or Deb Zynomirski, VP at 416-566-9337 if you have questions or comments. Sandi Marr is the Recording Secretary for the DHS and can be reached at sandi.h@sympatico.ca. Our October program night began with a full house of 105 people including some junior gardeners and their families. President Debbie Thomas warmly welcomed everyone, members and guests. 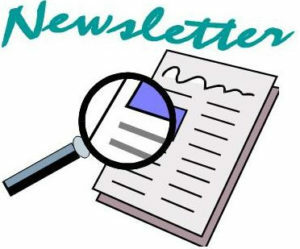 Treasurer’s report and September minutes were posted on the bulletin board. A special welcome was extended to Mason Zynomirski, our newest student recruit from Dunnville Secondary School. Mason has committed to earn his 40 hours community service with DHS as he joins us with tech support. Welcome Mason! 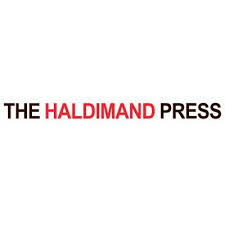 Huge win at Haldimand County Recognition Night (HCRN). DHS received the “Community Project Award under $10,000.000 for decorative edging and plantings around East and West Dunnville signs and Muddy the Mudcat. Thank you to Russ Savage and George Byleveld for excellent work on these projects. Thanks to the Rotary Club for their funds along with HC for this project. We also recognize and thank Grand Country Garden Centre (Garden Gallery), McKay’s Tree and Stump Removal, and Haldimand County for donation of mulch. Congrats also to: Steve Elgersma (volunteer nomination) and Michelle Zynomirski and Brant Richardson (youth volunteer nomination) at Haldimand County Recognition Night. We are very proud of our DHS volunteers. Appreciation was expressed to all. Oct. 22 is our “fall clean up” day. We’ll meet at the bridge/condo parking lot at 9am and concentrating on removing annuals. Mike Lessard of “Jeff’s Lawn Care” will join us with his trailer for hauling our plant debris. Many hands make light work! Oct. 26 is our “fall bulb planting” day. Again, we’ll meet at the bridge/condo parking lot at 9am to plant fall bulbs, including our special “Canada 150” tulips. Bring a trowel, gloves, and knee pads. Come and help as you are able. Nov. 5 is our “decorate winter planters” day. We’ll gather at the fountain at 10am. This year we have 24 planters to fill so volunteers are welcomed. If you are able to help, please bring your pruners, gloves, and any items you might have such as birch, curly willow, hydrangea, evergreens, etc. Nov. 11 is the “Remembrance Day” ceremony. Meet at the Cenotaph at 10:30am for 11am laying the wreath. Thanks to Wray McLean for volunteering to represent DHS. Call for new Directors: we welcome anyone interested to join our board. DHS board is a great place to share your gifts and passion for gardening. New volunteers bring fresh ideas and vision. Please speak with Debbie Thomas or Deb Zynomirski if you are interested. Installation of board members occurs at our upcoming Nov. program meeting. Flower, Vegetable and Pumpkin Show: jr. gardener winners were presented. Scarecrow: 1st prize – Alicia Stavinga. Thanks to our judges: Denise Richardson, Marlene Link, and Pauline Bradford. 2016 Survey was distributed. Everyone was encouraged to offer feedback. Next month, those who submitted a survey will be entered in a draw. We value everyones’ comments and suggestions as we move forward into 2017. Refreshment break was announced with appreciation to our volunteers. Tonight’s snack was provided by: Barb Whyte, Lynn Loney, Petra Kruis Daly, Carol Mulder, Susan Milligan, Kim Christoff and Marlene Link. Refreshments are a highlight of our program night. Special thanks to Wray and Bev McLean for arriving early and organizing our monthly snacks. Please speak to Bev if you are interested in providing refreshments in 2017. Our guest speaker, Jeff Bokma, General Manager of Vermeers, Welland was introduced. Jeff is a returning favourite at DHS. He has been employed at Vermeers for over 20 years and indoor/outdoor plants are truly his passion. Jeff presented a very informative and interesting powerpoint on “Houseplants 101” and answered many questions related to the care of houseplants. He brought along some unique plants for us to become acquainted with. We were honoured to have Jeff back with us again. Flower, Vegetable and Pumpkin Show winners in the adult categories were announced. Thanks to everyone who participated and to Pauline Bradford for organizing this event. Pumpkin Carving – Most Gruesome – Brant Richardson, Funniest – Bruce Burton, Meanest – Marilyn Stavinga, Scariest – Bruce Burton. Next month is our AGM/Christmas Potluck and we will gather at 6pm. It will be a full evening with food, fellowship, AGM, Jr. Gardeners Award Night, Christmas Potluck Celebration, Penny Sale, 4-Seasons Garden Photo Contest, and our Food Drive for the Salvation Army. Speaking on “The right food for the right bird at the right time” will be Gary Cartlidge, Armstrong Milling, Dunnville. There will be no Ways and Means. Ways and Means winners were also called and many recycled garden treasures were claimed by our winners. Thanks to everyone who attended, first-timers and regular attendees. Finally, a big thanks to everyone who pitched in to make tonight’s program such a success. Every hand helps! 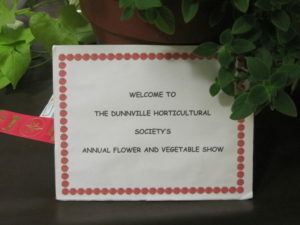 Be sure to check our website for regular updates between programs at: www.dunnvillehortandgardenclub.org. Thanks to Pauline Bradford for organizing and to our judges: Marlene Link, Denise Richardson, Pauline Bradford. A Big Thank You to Kim Christoff, Steve Elgersma, Marilyn Stavinga, Bev McLean and Debbie Thomas on behalf of the DHS. 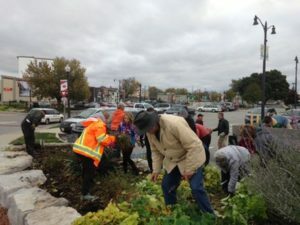 On Oct. 12 this crew of volunteers were busy planting over 200 tulip bulbs in the flowerbeds by the East and West Dunnville signs. So, next spring we will see a beautiful floral display of red and white colour for our “Canada 150” ….thanks to these hardworking gardeners. Let’s give them a big shout out for their dedication! Dunnville, Ontario. 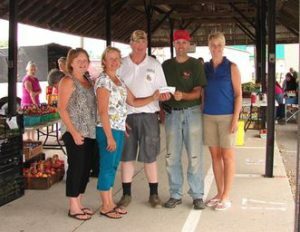 Members of Dunnville’s Horticultural Society proudly deliver a cheque for $5001 to the Dunnville Market Redevelopment Committee. Careful planning and special fundraising over the past four years have lead up to this donation. The DHS mandate and that of the Dunnville Market group both fall under OMAFRA, and the Horticultural Society felt an important sense of responsibility to support its sister organization as it proceeds towards its new facility.